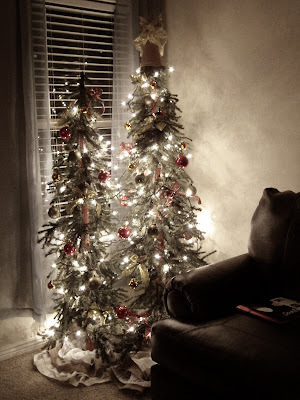 At my house, we have three beautiful small Christmas trees rather than one big tree. So, Meg helped me make 3 small Christmas tree skirts. If you have a small tree you are going to want yo make this! The circumference of each skirt's base is 24 inches, so the radius is 12 inches. Using those numbers, you can just refer back to our "regular size" Christmas tree skirt post for directions on how to put it all together. Good luck and Merry Christmas! !